All opinions stated are my own. I purchased each pillow on my own and I am not receiving any remuneration for this review. Congratulations on your multiples!! If you’re struggling with choosing between the Twin Z and My Brest Friend nursing pillow, than this review is for you! When I found out I was pregnant with twins, I knew right away that I wanted to invest in things that would make my life easier with them. Even if I only used them for a month or two, my thought was that if it made juggling two babies, any less tricky, it would be well worth it!! I was sure I would end up tandem nursing at some point, as I do my best to not let my babies cry if I can help it. I had asked in some Facebook groups for moms with multiples and two names emerged a lot. 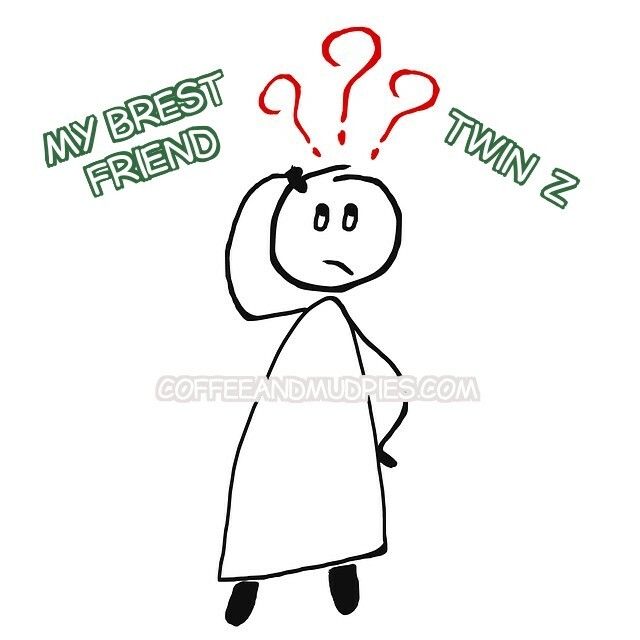 The Twin Z and My Brest Friend. In my search and reading through tons of reviews, Both had pros and cons. I decided I couldn’t decide and bought both! It has a cotton removable, washable cover. One side has a ridge on the outer edge. This help keep babies directed toward the breast and work as an anti roll, much like placing a rolled up baby blanket behind their back. You are able to flip it over for a no ridge effect if you prefer. All straps are adjustable. You have the heavy-duty Velcro you can adjust for a looser or tighter fit but also the option of a buckle. This is handy as you don’t have to readjust every time; Plus you’re not making that horrible “ripping” sound after you have gotten babies to sleep! This was the first pillow I got. My first thoughts were something to the effect of this is “slightly intimidating”. Its pretty big! Of course, big is necessary and once you use it a few times it’s really no big deal. This pillow is sturdy!! Made of recyclable foam, it is literally like strapping on a squishy table. I was able to stand up with this on (without babies!!) and not have it fall off which came in handy more than a few times!! My Brest Friend Twin Pillow is fairly thick so it raises the babies up a good deal. Nursing two has left me well endowed and far from perky so I actually had to lift my breasts UP but I found that this was better than having to slump over to get the breast to my babies. I could NOT use this pillow on the bed. For some reason sitting on the bed lifted it up that much more and it became very awkward. Babies were to high and it just did not fit right. It quickly became my “Brest Friend couch pillow” where it did its best work!! 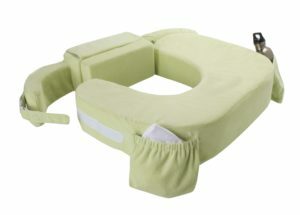 My Brest Friend twin nursing pillow really shines when it comes to smaller babies who have no muscle control. This is due to the fact that it does not tend to “droop” inward like the typical nursing pillow. Making it far easier as you’re less likely to have them slip in between the pillow and your body causing you to have to readjust your babies. The Brest Friend Pillow made it very easy, comfortable and enjoyable to sit on the couch watching tv or reading a book while babies slept close to me on the pillow. The back pillow. I found it to low to really be comfortable! However, there is an extra pad that can be removed depending on your need. I did preferred to have the twin pillow buckled around me to prevent it from coming away from my body. So I felt I really had no choice of whether or not to have their back support on. To remedy the feeling of the support being to low, I usually liked to add a softer pillow for more support higher up on my back. I found it great to use as a play pillow to surround one of the babies while they practiced sitting on their own. My now 10 month old still loves to crawl into it and play in the circle! My Brest Friend pillow did a fantastic job. I used it a lot especially when the babies were small as I felt that it supported their bodies really well. With no sinking inward toward my body I did not have to constantly adjust the babies, which was a huge plus juggling two at once. I believe this would benefit anyone who tends to have smaller babies, maybe even preemie babies. Having the babies fully supported frees up your hands so you can use them to help direct and hold your breast if need be (like me) or so you can do other things.. like eat!! Materials: Cotton shell, polyester fiberfill and covers are made of super soft polyester fabric. I really appreciated that the materials are not doused in any flame retardants! Measurements in inches: 36 x 24 x 5 and weighs around 5 to 6 pounds. This ingenious design is based on a typical nursing pillow with a twist. Instead of placing the pillow in front of you and buckling in the back or side, you wrap it around your back after raising the center piece which is used for back support and buckle in the front. The back support was a good deal better than I expected. I could actually sit on the bed with nothing behind me and feel supported. Multi function. 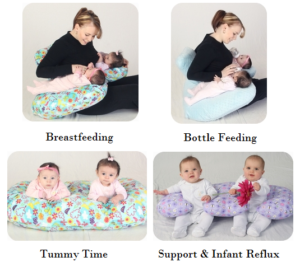 I loved that the Twin Z could be used for other things..Including bottle feeding (didn’t try it myself), tummy time, sit and play, and pregnancy pillow (loved it, slept with it every night!). I used it a good deal for nap time when my babies were little. Id put the pillow somewhere where I was going to be, pull the strap tight before laying them on it and it would cradle them while they slept. It was perfect as they caught my cold and were stuffed up. However, this had them at a perfect incline which helped their breathing! I could easily use it on the bed. It took a bit of awareness as I would need to position my legs/knees under the pillow to keep babies angled toward me and at the right height. I was fine with this personally, actually even preferred it, as I could custom it to our need and preference at that moment. I did find that smaller babies especially can wriggle down between your body and the pillow.. depending on a few different factors. But I found that as my babies got bigger and stronger this was no longer an issue and I actually started to prefer this one to the Brest Friend pillow. I took this pillow with me everywhere. If we went to a friend’s house to visit, it came with me. We went to the pool and I was just on the sidelines.. ya it came..I would just sit on the ground and use my legs to find the perfect balance for us. Sometimes that was cross-legged, other times they were relativity straight. Though I felt a little silly with this big pillow, it was the best way to successfully get out with both babies while they were little, as it allowed me to tandem nurse. Therefore reducing stress for me because really, what causes more stress than TWO crying hungry babies!! Worked like a charm. The Twin Z Nursing Pillow is great for Multi-use lovers like me. I found it very versatile and could use it in many places including the floor, bed and couch. The back support is really great and so far has not lost this ability! So as you can see both have great things about them. It is hard indeed to pick just one. The first couple months I found I leaned towards the My Brest Friend Twin Nursing Pillow for its sturdy, no rolling between mom and pillow, make life easier tandeming with small twins ability! Sitting on the couch with this helper is super comfortable and stable! It really enabled me to focus more on my babies with less stressing over constantly having to readjust their positions. Once they were asleep I was able to just sit there and enjoy, comfortably!! Once my babies started to get stronger and could guide/hold themselves a bit, I found myself reaching more for the Twin Z Nursing Pillow. I just felt like I could custom fit each baby by simply moving my legs. I’m a person who loves options/ability to customize and multi use items so this pillow is up my alley!! I enjoyed the back support much more than MBF and felt I could use it anywhere. If I had to choose just one?? Could I have used either one throughout? Absolutely! Both are excellent! I tend to have bigger babies, even with my twins who weighed in at 8bs 12oz and 7lbs 2oz, (You can read our home-birth story here) so do keep that in mind. Even sitting here now analyzing which one I would pick I still find it difficult to do so. Each one was excellent during the times I used them and for different reasons. Therefore, there is no doubt in my mind that I would choose to buy both if I had to do it all over again. There is so much adjustment that happens in the first few months. I say this not as a sales pitch. But rather as permission to ourselves to splurge on things that can make life a little less stressful. I wanted to enjoy my babies!! If having two different pillows helped make that just a little more possible, than it is more than worth it in my opinion! FYI.. it is possible to find both pillows used. I suggest utilizing your local FB buy and sell groups, newspapers, and online selling sites like Craigslist. Where can you find Twin Z? Where can you find My Brest Friend Nursing Pillow? I hope this review has helped you a little in your decision-making. I’d love to hear from you! What nursing pillow did you decide on? What have you loved and not loved about them? Awe… Thank you! 🙂 I appreciate that! So glad it was helpful to you!